OSC provides Marine Mammal Observers (MMOs) for the marine seismic industries. Our experienced and qualified MMOs assist in reducing the impact of operations on the marine environment without breaching environmental protocols and regulations to ensure that marine industrial operations are compliant with mitigation guidelines. 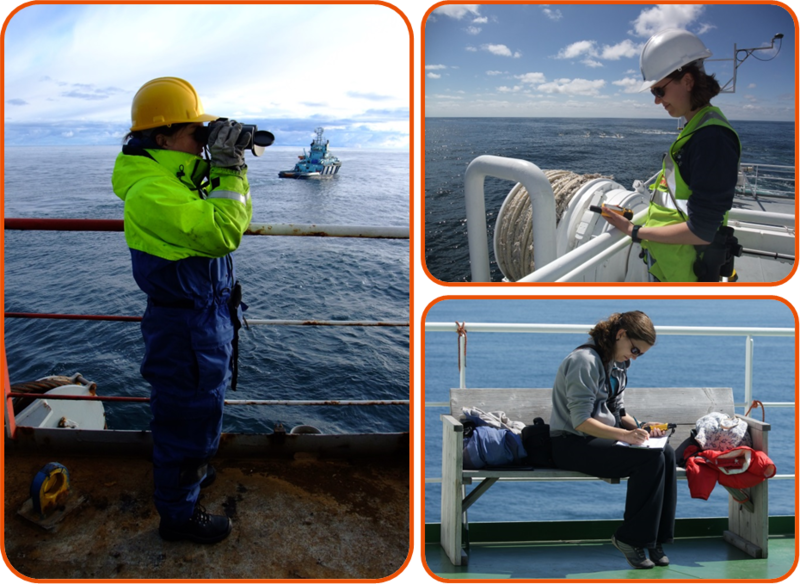 Marine Mammal Observers are also used for the purposes of scientific research, for example when employing distance-sampling methodologies to derive population estimates. In both cases, mitigation actions, including soft starts, delayed soft starts and airgun shutdown, will be implemented when marine mammals or turtles are sighted within specified distances (typically 500 or 1000 m). Compressed Air Emergency Breathing System (CA-EBS) initial deployment training. Van Oord Safety Induction including Environmental & Political Management. New Zealand Department of Conservation (DOC). OSC also runs a New Zealand DOC accredited MMO and PAM training course. MMOs are typically experienced and qualified prior to joining our team, but most candidates, particularly cruise leaders, still receive in-house training to ensure a high standard is adopted by OSC staff, at all times. It also ensures that there is a pool of personnel adopting universal methodologies, which in turn can facilitate data comparability for future surveys and monitoring. New Zealand waters: Department Of Conservation code of conduct (DOC, 2013) applies to cetaceans and pinnipeds during seismic surveys. The science of infra-red (IR) night-time vision technology is still in its infancy. We have conducted some preliminary research on night-vision systems and trialed their use in the field during marine mammal observations, with poor results, so OSC is unable to warrant and recommend this methodology. Nevertheless, we are willing and capable of providing this service according to regulatory necessity (e.g. German and Australian waters).